Cambridge is easily accessible by road, rail or air - just 50 minutes from central London and 30 minutes from London Stansted airport. 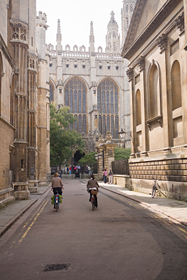 Cambridge is a compact cosmopolitan city with outstanding architecture old and new. The beauty of its ancient centre is preserved with its medieval streets, college courts, gardens and bridges. Cambridge the city of crocuses and daffodils on the Backs, of green open spaces and cattle grazing only 500 yards from the market square. Cambridge is a delight in any season: relax in its many pubs, restaurants and cafes whilst exploring the independent shops around the historic market place. There are brand new shopping areas with all the high street favourites that you would expect. Be inspired by the museums and art galleries. Spot the stars of the future at a student theatrical production, or see a show at the Arts Theatre. Cambridge was important long before the University existed. Here, at the meeting of dense forests to the south and trackless, marshy Fens to the north, was the lowest reliable fording place of the River Cam, or Granta. In the first century BC an Iron Age Belgic tribe built a settlement on what is now Castle Hill. Around AD40 the Romans took over the site and it became the crossing point for the Via Devana which linked Colchester with the legions in Lincoln and beyond. The Saxons followed, then the Normans under William the Conqueror, who raised a castle on a steep mound as a base for fighting the Saxon rebel, Hereward the Wake, deep in the Fens at Ely. The motte of William's castle still stands and Ely Cathedral is visible from the top on a clear day. The first scholars didn't arrive in Cambridge until 1209 and another 75 years passed before Hugh de Balsham, Bishop of Ely, founded Peterhouse, the first college. Clare (1326), Pembroke (1347), Gonville and Caius (1348), Trinity Hall (1350) and Corpus Christi (1352) were established in the first half of the fourteenth century. Ten more colleges were founded during the fifteenth and sixteenth centuries, including Christ's (1505), King's (1441), Queens' (1448), Jesus (1496), St. John's (1511), Trinity (1546), and Emmanuel (1584). Click here to view our properties to let in Cambridge.